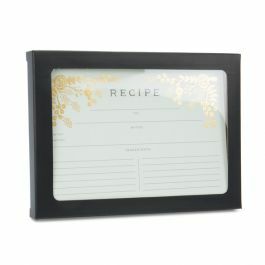 This Black Matte Paper Window Box offers a polished display for stationery, wrapped candy, and gifts. 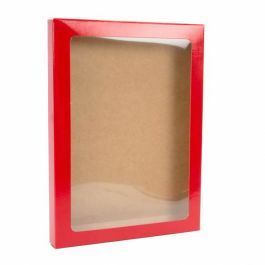 WMBG10 is our 3 3/4" x 5/8" x 5 3/16" paper box that features a clear window display that measures 2 15/16" x 4 3/8". This box holds eight A1, 4 Bar products. 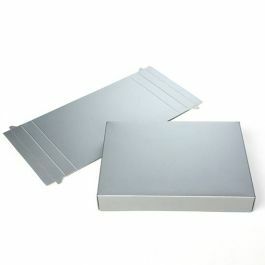 Easily assemble this one-piece box along soft fold lines. 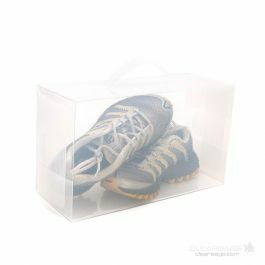 Box includes a clear, archival sheet glued to the inside of the cut-out window. Stickers not included. 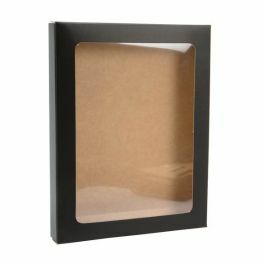 Our WMBG10 Paper WIndow Box in Matte Black measures 3 3/4" x 5/8" x 5 3/16" and has a window opening of 2 15/16" x 4 3/8" to give customers a glimpse of your product before they buy. 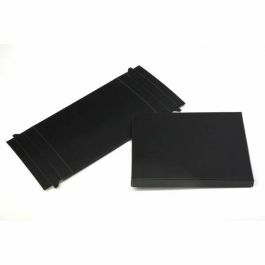 Ideal for up to eight A1, 4 Baronial cards and envelopes, this box also works great for holding jewelry, wrapped candy, ties, socks, and other niche gifts. Claycoat printed with a matte PE lamination, this one-piece box provides a distinctive look on retail shelves. 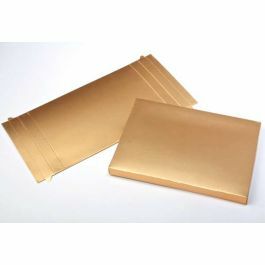 The attached poly sheet is made from 10 mil thick material, while the 300 gsm paper is sturdy yet delicate. Assemble by folding along soft creases. Brand or label on the solid backside of the box. Custom printing is available. Most popular use for WMBG10 is for displaying A1, 4 Baronial cards and envelopes.